Killing the messenger takes new meaning when you see it live, in living color, as happened in the deaths of a Virginia television news reporter and her cameraman. 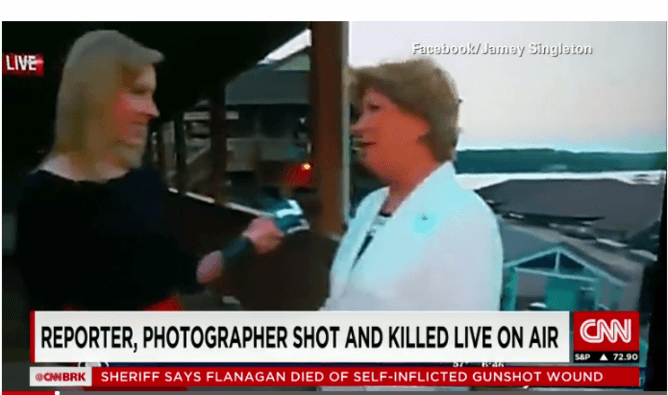 WDBJ correspondent Alison Parker was conducting an on-air interview in a Moneta, Va., shopping center when she and the photographer, Adam Ward, were shot and killed by a disgruntled former colleague who also videotaped the attack and put it on social media. 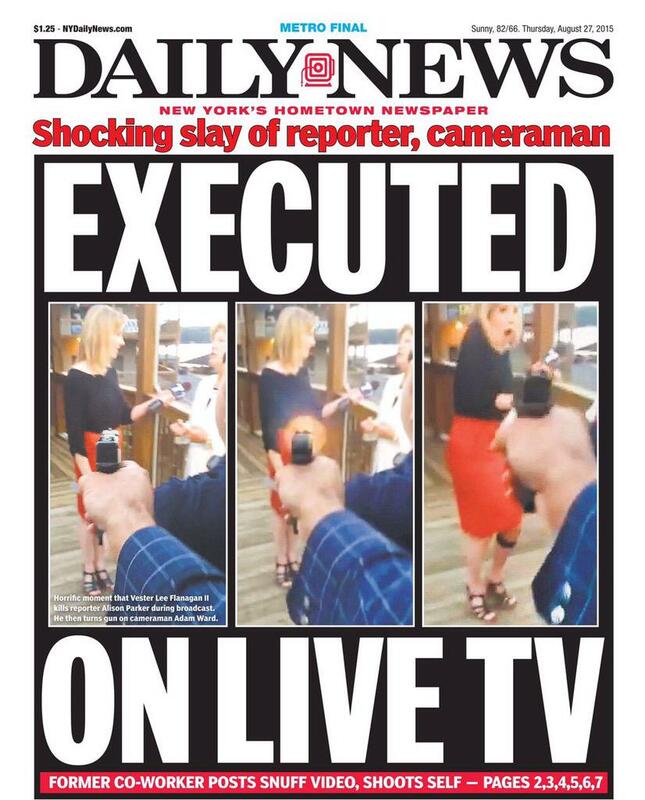 The New York Daily News gave the murders front-page display, in very graphic detail than some TV outlets shunned. Killings on video are increasingly common these days. Journalists are among those targeted now, becoming victims and not just reporters of events. Parker and Ward’s names are now added to a list that included James Foley and Daniel Pearl. Tech-savvy killers use social media and the internet these days to show their crimes. The Islamic State group released a video in 2014 showing Foley, clad in an orange gown, kneeling on the ground next to a man dressed in black holding a knife. Foley makes a short statement and then is decapitated. In 2002, Pearl, a correspondent for The Wall Street Journal, disappeared while on assignment in Karachi, Pakistan. Video shown around the world via the Internet showed Arab extremists cutting his throat, then decapitating the reporter. In this world of social media, terrorists don’t need reporters to tell their message. Terrorists can do that themselves now, and one way of doing that is killing reporters. The Virginia slayings were tied to a different kind of terrorist, one with a workplace grudge. Vester Flanagan worked as a WDBJ newsman until he was fired for unprofessional conduct. He videotaped his shooting of Parker, Ward and a woman being interviewed by Parker. Flanagan led police on an auto chase until he crashed, and was found in the car with a self-inflicted fatal gunshot wound. “Whatever the shooter’s motivations, the idea that journalists are targets for infamy seekers is now an idea in our culture,” writes Andy Ruddock, a senior lecturer in the School of Media, Film and Journalism at Monash University, Melbourne, Australia. His comments appeared in conversation.com. The website is an Australia-based independent, not-for-profit media outlet that uses content from academic and research sources. Colleagues were forced to cover the deaths of Parker and Ward as it happened, Ruddock pointed out. Footage of the crime forced news outlets to discuss how much of it should be used. Some used more, some used less. Most alerted viewers to the sensitive nature of the images. Professional journalist would be expected to make news judgments based on ethics and professional standards. Russell Frank, another conversation.com writer, points out that fiction on-screen killings are as common as weather reports. Frank is associate professor of communications at Pennsylvania State University. News organizations often are consumed by motivation. “Perhaps news organizations would do better to ignore them and focus on the victims,” wrote Frank. “Certainly, we humans have always been fascinated with the criminal mind – with what makes transgressors tick. But is the possible role of the news media in inspiring copycat criminals even part of the newsroom discussion anymore?” Frank asks.